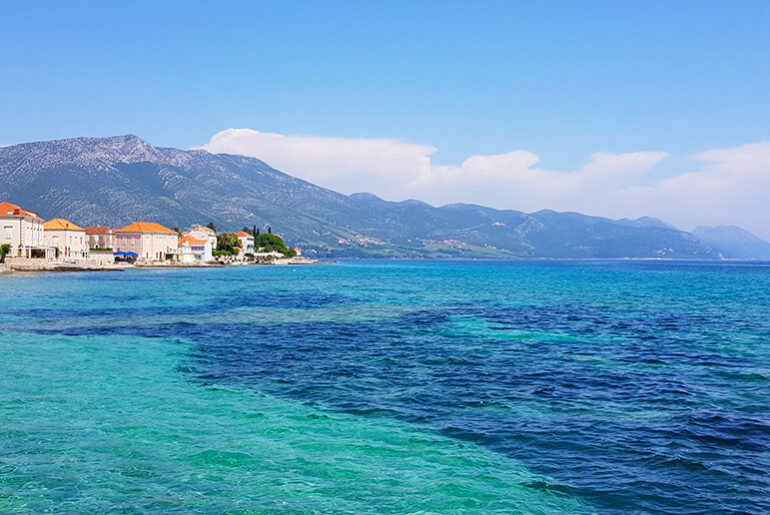 The Peljesac Peninsula is famous for its wine, windsurfing, beaches and seafood – especially oysters. Now, that sounds like a winning combination to me! 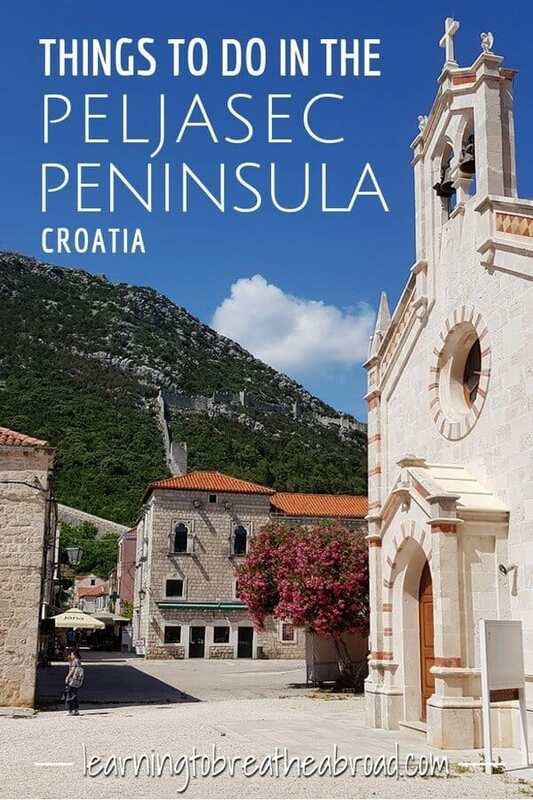 Away from the popular tourist hubs, the Peljesac Peninsula is quiet and sleepy, with quaint villages, fascinating historical sites, sun-drenched vineyards and the most brilliantly turquoise waters. Situated between Dubrovnik and Split, this gorgeous strip of land is often overlooked by tourists in favour of other more popular towns, which makes it the perfect place to come to relax and unwind. Driving from Dubrovnik to Split requires that you pass through Bosnia & Herzegovina. The alternative is to drive up the Peljesac Peninsula and then catch the inexpensive ferry from Trpanj to Ploce. 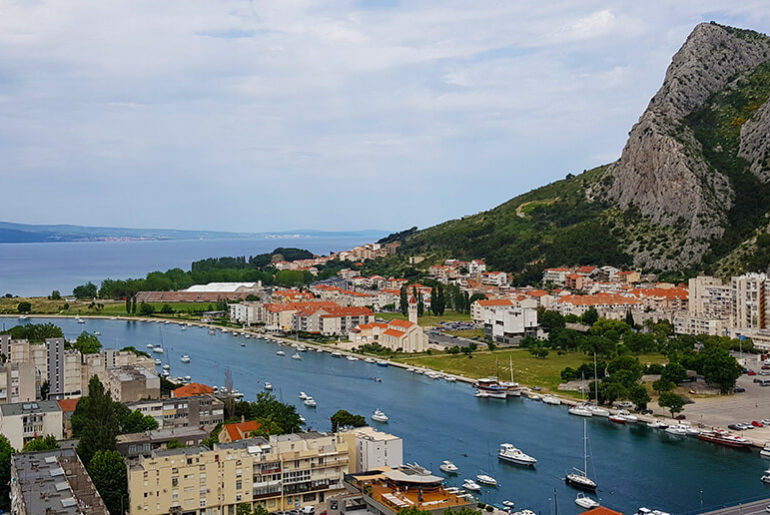 No border crossings, no green card insurance issues and some of the most spectacular scenery you will find in Croatia. The ferry from Ploce on the mainland dropped us in the pretty fishing village of Trpanj and although its’ beautiful beach with crystal clear water looked super inviting, we headed straight out to Orebic. We found out afterwards that there is a bay with healing mud that would have been good to try, had we know earlier. The seaside promenade had some great looking restaurants and shops where you could also while away some time. Top tip for slow campervans: There is a steep hill when leaving Trpanj and if you drive straight off the ferry, you’ll have a convoy of cars right behind you, so take the time to stop in Trpanj and let them all cruise off before you. We created a fair tailback, so pulled off halfway up the road to allow them to pass. 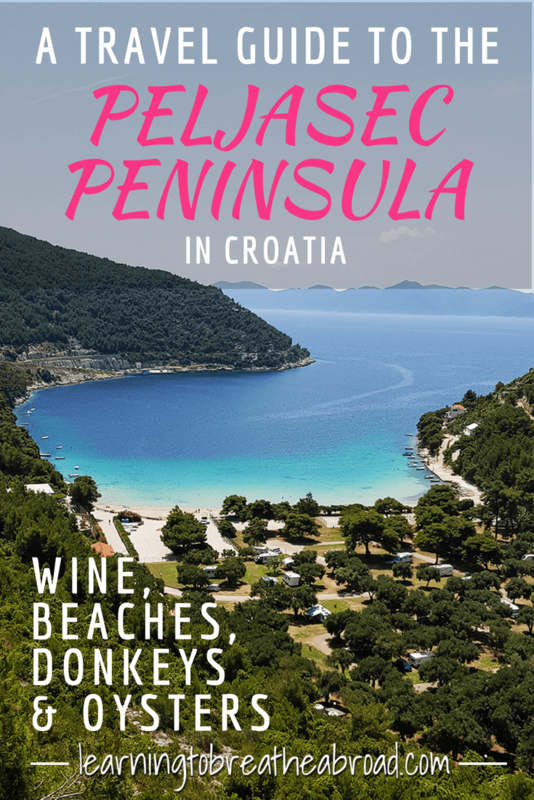 Orebic is the biggest town on the peninsula and we completely fell in love with it! The colour of the water was incredible and you had a choice of pebble or sandy beaches to relax on. Only 2.5 km across the water and a quick ferry ride away is the medieval town of Korcula – Marco Polo’s hometown – which makes a for a great day trip. There is a little promenade running the length of Orebic town, so we spent our days cycling along it, stopping here and there for a swim in the numerous bays. We stayed on an open field (42.975201,17.169201) right next to the sea with a stunning view. On waking, I would pull on a bikini and walk straight into the sea for a morning dip! The owners couldn’t have been more kind and helpful and there was electric hookup from 6 pm until 9 am. The cost per night was 70Kuna – what a win! 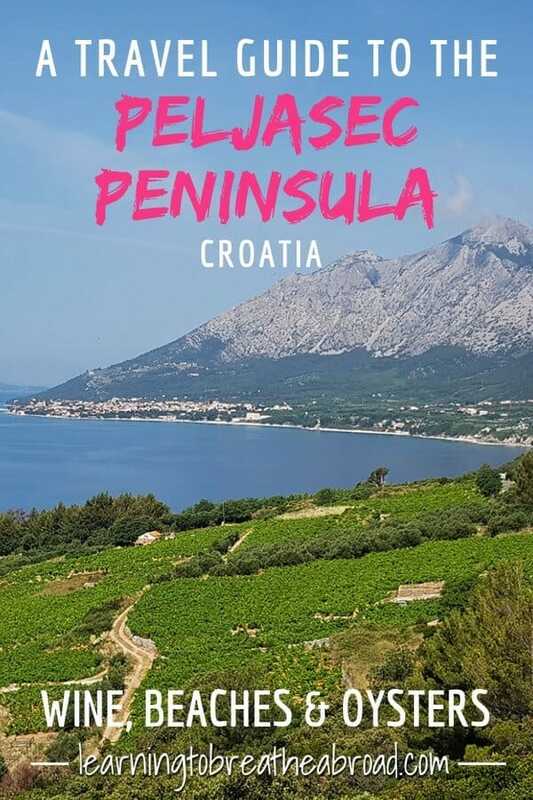 The Peljesac peninsula has three distinct areas. The North is geared towards beaches, windsurfing and kitesurfing. The middle is the wine centre with sprawling vineyards as far as the eye can see, not to mention wine farms and wine tasting opportunities at every turn! The South is for historical sites, salt and lots of oysters. I had read about a family run donkey farm near the town of Kuna, where you could pet, ride and even milk a donkey – yes, milk a donkey! Obviously, we had to try so off we set. On arrival, there was not a soul in sight save the donkeys. A cycle tour arrived shortly thereafter and when I told the guide we had come to milk the donkeys, he near fell off his bike laughing. He was a local and brought tour groups here all the time and in all his years he’d never heard of tourists being able to milk the donkeys. Oh well, at least we got to see the new foals. We spent the day slowly cruising down the peninsula, stopping at little villages and bays along the way. From Kuna, we traveled down to Trstenik on the West coast and from there we headed across to Drace on the East coast. The road hugged the coastline offering panoramic views out over the sea and the numerous islands dotted alongside. At Brijesta, we continued South, once again crossing over to the West coast at Prapratno – possibly the most exquisite beach in the whole of Croatia. There is a campsite right at the beach and I wished we had more time so we could just hang here for a few days. Another crisscross of the peninsula, this time to the little village of Hodilje, where we had been recommended a fabulous restaurant right on the water. It’s the only restaurant so you can’t miss it. Oh yes, it was time for oysters and by golly they were good! We spent a very lazy afternoon here, swimming, eat, drinking and enjoying the gorgeous view and then headed over to Ston. 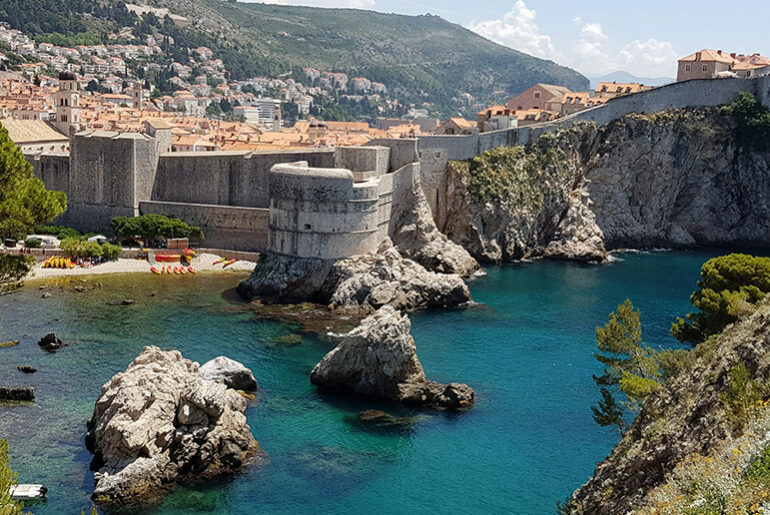 During the 14th Century, the value of salt was equal to that of gold, so to protect the salt pans of Ston, the Dubrovnik Republic built 5.5km of fortified walls, the longest fortification walls in Europe! They consist of three forts, forty-one towers, seven bastions, four pre-walls and a water-filled moat and are open to anyone who wants to walk them. The admission fee is 40 kuna for adults, and 20 kuna per child. The walls extend from the town of Ston, over the hill and down to the village of Mali Ston. It only takes about 30minutes each way so if you time it right you can have a lunch in Mali Ston and then head back to Ston. 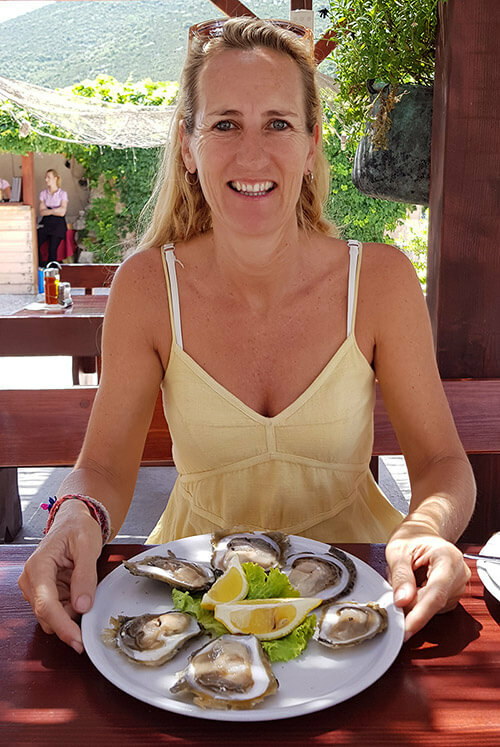 There are lots of little restaurants in both Ston and Mali Ston, all offering fabulous seafood and of course, the specialty, oysters. Just be warned if you are going in Summer, it gets really hot up on the walls. We took an umbrella which worked like a bomb! The town of Ston has many old buildings, narrow alleyways and lots of nooks and crannies to explore. The first thing you’ll see when crossing under the stone archway. is the Church of St Nicholas. Behind that is the imposing Fort Kastio from which you have brilliant views of the fortified walls going over to Mali Ston and a great view over the town. Looking the other way you will see the salt pans stretching into the distance. The salt pans of Ston are now all privately owned, but the method of salt making, by means of evaporation of sea water naturally, has not changed since the 13th Century, so don’t forget to stop by the salt pan museum to see how they do it. 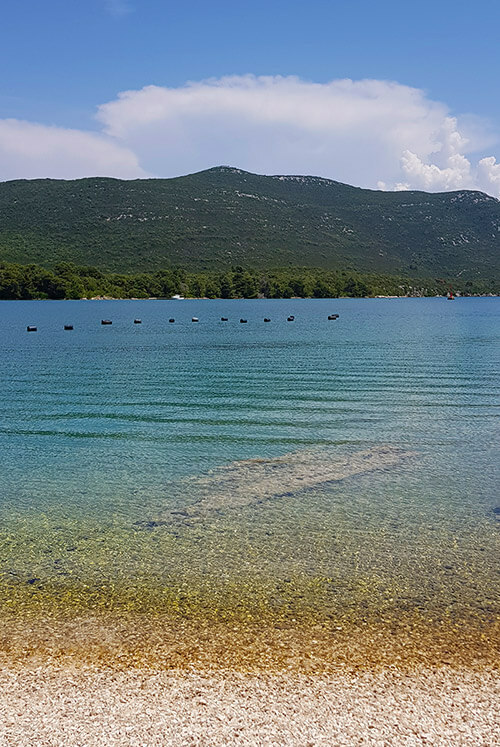 After spending 3 weeks exploring Croatia, I thought we had seen all the best places, but the Peljesac Peninsula with its slow pace, gentle people, incredible beaches, breathtaking views and let’s not forget my favourite… oysters, this narrow strip of land completely stole my heart.